Torkwase Dyson works through multiple forms and describes herself as a painter who uses the language of architecture and minimal geometric abstraction to generate descriptive fragments of space. The works are distilled deconstructions of natural and built environments and consider how individuals negotiate and negate various types of systemic orders that impact environmental justice. Dyson’s work has been exhibited at the Studio Museum in Harlem, the Whitney Museum of American Art, the Corcoran College of Art and Design, the Schuylkill Center for Environmental Education, and the Smithsonian National Museum of African Art. 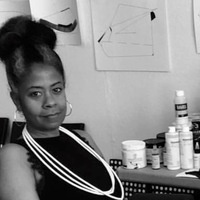 Dyson is the recipient of Joan Mitchell Foundation Painters & Sculptors award, Nancy Graves Grant for Visual Artists, Visiting Artist grant to the Nicholas School of the Environment at Duke University, the Culture Push Fellowship for Utopian Practices, Eyebeam Art and Technology Center Fellowship, and the FSP/Jerome Fellowship. Dyson’s work has also been supported by The Drawing Center, Lower Manhattan Cultural Center, The Laundromat Projects, the Green Festival of New York, the Center for Documentary Studies at Duke University, the Mural Arts Program of Philadelphia, The Kitchen, and the Rebuild Foundation. In 2016 Dyson was elected to the board of the Architecture League of New York as Vice President of Visual Arts. Torkwase is now based in Brooklyn, New York and is a visiting critic at Yale School of Art.